A terminal or comm server provides out-of-band access to multiple devices. A terminal server is essentially a router with multiple, low speed, asynchronous ports that can be connected to the console ports of other devices, such as routers or switches. The terminal server allows you to use a single point to access the console ports of many devices. A terminal server eliminates the need to move the console cable from device to device. You can also configure a modem on the auxiliary port of the terminal server, to provide dial-up service to many network devices when network connectivity fails. 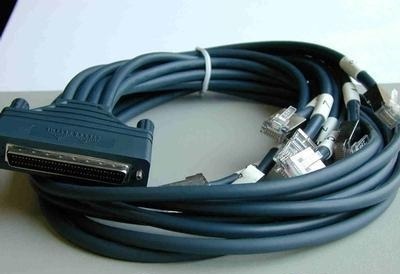 The Cisco 2509 – 2512 series routers use a CAB-OCTAL-ASYNC to provide eight RJ-45 roll over cable. You can connect each RJ-45 roll over cable to the console port of the managed device. The 2511 router allows for a maximum of 16 devices to be remotely accessible. Alternatively the NM-16A or NM-32A high density async network modules can be installed in the Cisco 2600 and 3600 series routers to provide the same function. !— This address is used in the IP host commands. !— Work with loopback interfaces, which are virtual and always available. !— Use a public IP address to ensure connectivity. !— This is the default gateway when routing is disabled. !— For example, if the router is in boot ROM mode. !— Set the default route for the external network. !— The session times out after 20 minutes of inactivity. !— Unwanted signals from the attached device do not launch. !— due to a rogue EXEC process. !— This disables exec timeout transport input all. !— Allow all protocols to use the line. !— Configure lines 1 – 16 with at least transport input Telnet. !— Auxiliary port can provide dial backup to the network. !— Note: This configuration does not implement modem on AUX port modem InOut. !— Allow auxiliary port to support dialout and dialin connections. When I commented I clicked the “Notify me when new comments are added” radio button now whenever a comment is made I get a notification!